�Women get sicker but men die quicker,� might be a clich� but over the years it has driven so much of healthcare in Britain. Men�s health has often been a poor relation to women�s health, with men often dismissed as �uninterested� or too �masculine� to access health services. Certainly, statistically women are far more likely to access healthcare. But is this situation just down to a simple clich�. In the last two decades there has been an increasing input into providing health services aimed at men, but this is still a small and new area. 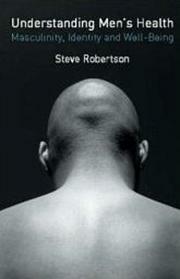 Against this background Steve Robertson�s book attempts to address the issues of men�s attitudes to health and why they do and don�t access health services. His book is based on his own research (narratives from a verity of lay men and healthcare professionals) and a very comprehensive literature review. Though written in an easily accessible style this book is not an easy read. Robertson�s chapters are brimmed full of information and analysis, a lesser author could have written a whole book from the information Robertson squeezes into one chapter. Each chapter left the mind racing with thoughts and ideas, so insightful was Robertson�s analysis. This book is far more theoretical then practical. If you are looking for tips and guidelines on setting up a men�s health service/clinic then this is not the book for you. If you are studying men�s health, are involved in policy creation or are looking at the ground work for a men�s health service then this book is a �must read�. Robertson�s insights into masculinity, accessing healthcare, men�s views of well-being, and men�s attitudes to physical and emotional health could help to shape an effective service.